Leading off today: Fifty points in a game is literally average work for Joe Girard III. 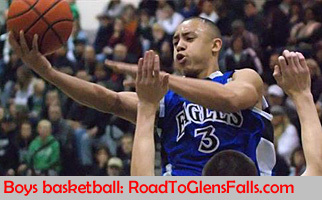 The Glens Falls star has averaged 50 a game for his last two seasons of high school basketball en route to more than 4,600 career points -- a total that will probably not be matched by a New York player for decades, if ever. How do you not put like ... 5 ... defenders on him? Jimmer and Girard are two of the most iconic players in NYS sports history. This place was up for GRABS! MR NY BASKETBALL JOE GIRARD LADIES AND GENTLEMAN! Really hope @NFHSNetwork submits the clip of Joe Girard III's championship-winning bucket to that other sports cable channel's #SCtop10.